Apple has the iPhone XR, Sony has the Xperia XZ2 Compact, and Samsung will soon have the Galaxy S10 Lite. According to recent reports, though, these devices will eventually face tough competition from Google’s upcoming Pixel 3 Lite series. Speaking of which, it has just appeared in a new set of renders courtesy of 91Mobiles. Unlike the regular Pixel 3 and Pixel 3 XL which sport different front panel designs, the Pixel 3 Lite models will be identical in every way except for size. 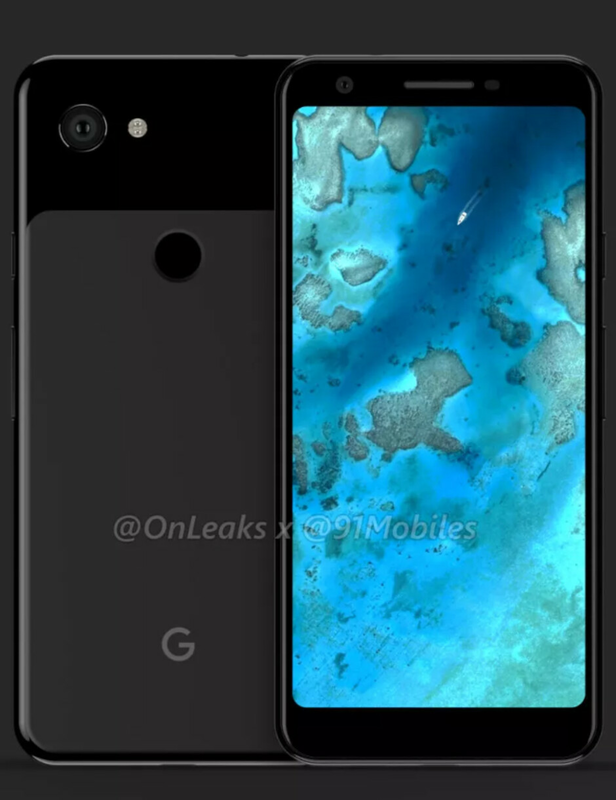 From the renders, it’s clear that both models resemble the regular Pixel 3 quite closely by making use of a notch-less display. This time around, though, the 5.5-inch and 6-inch panels feature a slightly taller 18.5:9 aspect ratio that is accompanied by thicker bezels all around. Despite the increase in bezels thickness, Google has removed the dual front-facing speaker setup in favor of just one above the display that doubles as an earpiece. Similarly, the wide-angle selfie camera has been removed too. Taking a look at the rear, both the Pixel 3 Lite and Pixel 3 Lite XL sport the latest iteration of Google’s two-tone design. But in what is presumably a cost-cutting measure, the internet giant has swapped out the glass construction for a cheaper polycarbonate one. Nevertheless, the fingerprint scanner has been retained alongside the single rear camera featured on the flagship Pixel 3 models, although this time around there’s a noticeable camera bump. Aside from this, the Pixel 3 Lite series features a USB Type-C port and what appears to be a second speaker on the bottom of the device, and a 3.5mm jack on top, which is certainly surprising considering Google removed the port on its flagship models. According to previous leaks, the Pixel 3 Lite and Pixel 3 Lite XL will arrive powered by the Snapdragon 670. The selected processor is then set to be accompanied by 4GB of RAM and 32GB of internal storage. Additionally, Android 9 Pie is to be expected straight out of the box alongside a 2,915mAh battery in the case of the smaller model. However, the battery capacity of the larger device remains unclear at the moment. The Pixel 3 Lite and Pixel 3 Lite XL are expected to go official in early 2019, perhaps at CES or MWC. In regards to pricing, the smaller variant is expected to retail somewhere between $400 and $500, while the larger model could cost as much as $600. With such a huge chin, they should be doing stereo front facing speakers like the Nexus 6. The article isn't even about Samsung. Don't know why you decide to mention them. Same thing Apple did with the XR as well, cheap garbage iPhone because they XS doesn't sell. On the footsteps of HTC to failure? It's hideous price of $400-$600 given one can buy a little older flagship for the same price as old as 8 months. Even cheaper! Here in UK Sony XZ2 was selling for £399! Or simply buy new 1+ 6 or 6T. I am aware camera probably is be biggest selling point for enthusiast but there is anything else hardly tempting from these two models. Ok, software. But neither software from other two brands are the slauch here. Nearly forgot Nokia 8.1! How could I? Well you add on Galaxy S9 that was going for under £500 too. 32gb of non expandable storage* selling for up to $600. I'll believe it when I see it. @sytaxlord, The iPhone7 is still on the market at those prices and based on the way I composed my post KingSam is technically correct. I give him a plus one for his find. Like you though I was definitely not considering a device from two years ago, and definitely not Apple's iPhones for that matter. Lol, yup I see it KingSam - you're right. To be fair I was thinking more of a device like this in the Android space being released this year. Apple definitely gets to play by it's own rules. “Do not compromise on camera.” That’s a good one. I like how this site is panning the design because of "thick" bezels. Those bezels will protect your phone much better if it's dropped, compared to the glass/metal sandwich of their much more expensive counterparts. Oh, and good luck getting replacement parts when you shatter your Pixel 3 screen, as there was an article here about how repair parts weren't available to repair stores yet. I'll take impact absorbing plastic and bezels all day, every day.